The aggregate market value (based on the NYSE quoted closing price) of the common stock held by non-affiliates of the registrant as of the last business day of the second fiscal quarter, June 26, 2015, was approximately $1.3 billion. As of February 1, 2016, there were 42,029,009 shares of the registrant’s common stock outstanding. The information required by Part III of this report is incorporated by reference from the registrant’s definitive proxy statement relating to the Annual Meeting of Shareholders scheduled to be held May 11, 2016, which definitive proxy statement will be filed no later than 120 days after the end of the fiscal year to which this report relates. Certain statements in this Form 10-K, other than purely historical information, including estimates, projections, statements relating to our business plans, objectives and expected operating results, and the assumptions upon which those statements are based, are “forward-looking statements” within the meaning of the Private Securities Litigation Reform Act of 1995, Section 27A of the Securities Act of 1933 and Section 21E of the Securities Exchange Act of 1934. Forward-looking statements may appear throughout this report, including the following sections: “Business,” “Management’s Discussion and Analysis,” and “Risk Factors.” Forward-looking statements involve risks and uncertainties, and future events and circumstances could differ significantly from those anticipated in the forward-looking statements. Actual events or results may differ materially. These forward-looking statements generally are identified by the words “believe,” “project,” “expect,” “anticipate,” “estimate,” “intend,” “strategy,” “future,” “opportunity,” “plan,” “may,” “should,” “will,” “would,” “will be,” “will continue,” “will likely result,” and similar expressions. Forward-looking statements are based on current expectations and assumptions that are subject to risks and uncertainties which may cause actual results to differ materially from the forward-looking statements, including the risks and uncertainties described in “Risk Factors” (Part I, Item 1A of this Form 10-K), “Quantitative and Qualitative Disclosures about Market Risk” (Part II, Item 7A of this Form 10-K), and “Management’s Discussion and Analysis” (Part II, Item 7 of this Form 10-K). We undertake no duty to update or revise publicly any of the forward-looking statements after the date of this report to conform such statements to actual results or to changes in our expectations, whether because of new information, future events, or otherwise. TrueBlue, Inc. (“TrueBlue,” “we,” “us,” “our”) is a leading provider of specialized workforce solutions, helping clients improve growth and performance by providing contingent staffing and recruitment of permanent employee solutions. Our workforce solutions meet clients’ needs for a reliable, efficient workforce in a wide variety of industries. Through our workforce solutions, we help approximately 130,000 businesses to be more productive and we connect as many as 750,000 people with work each year. We are headquartered in Tacoma, Washington. We began operations in 1989, specializing in on-demand, general labor staffing services with the objective of providing customers with talent and flexible workforce solutions to enhance the performance of their business. We expanded our on-demand, general labor staffing services through organic geographic expansion throughout the United States, Canada, and Puerto Rico. Commencing in 2004, we began expanding through acquisitions to provide a full range of blue-collar staffing solutions and to help our customers be more productive with a reliable contingent labor workforce and rapidly respond to changing business needs. Effective June 30, 2014, we acquired Staffing Solutions Holdings, Inc. ("Seaton"), which added a full service line of on-premise contingent blue-collar staffing, complementary outsourced service offerings in management of contingent labor services providers ("MSP"), and permanent employment recruitment process outsourcing ("RPO"). On-premise staffing is large scale sourcing, screening, recruiting, and management of the contingent labor workforce at a customer's facility in order to achieve faster hiring, lower total cost of workforce, increased safety and compliance, improved retention, greater volume flexibility, and enhanced strategic decision making through robust reporting and analytics. MSP solutions provide customers with improved quality and spend management of their contingent labor vendors. RPO is high-volume sourcing, screening, and recruiting of permanent employees for all major industries and jobs. The addition of Seaton expanded our services and capabilities to better meet our objective of providing customers with talent and flexible workforce solutions they need to enhance business performance. We have expanded our on-premise staffing and recruitment process outsourcing capabilities with two additional acquisitions. Effective December 1, 2015, we acquired SIMOS Insourcing Solutions (“SIMOS”), a leading provider of on-premise workforce management solutions. SIMOS clients include Fortune 500 companies in consumer goods, retail, online commerce, and food packaging and distribution. SIMOS specializes in helping clients streamline warehouse/distribution operations to meet the growing demand for online commerce and supply chain solutions. They are also experts in providing scalable solutions for pick and pack, and shipping requirements. Their unique productivity model incorporates fixed price-per-unit solutions to drive client value. Additionally, their continuous analysis and improvement of processes and incentive pay drives workforce efficiency, reduces costs, lowers risk of injury and damage, and improves productivity and service levels. SIMOS broadens our on-premise staffing footprint with an additional 37 sites across 11 states. Effective January 4, 2016, we acquired Aon Hewitt’s RPO business, a leading provider of RPO services. Aon Hewitt's RPO clients include Fortune 500 companies primarily in the hospitality, banking, industrial, retail, and service industries. This business specializes in the sourcing, screening, and recruitment of permanent employees for various industries and positions. Their service delivery teams work as an integral partner with customers in providing talent acquisition services from sourcing candidates through hiring employees. Their service delivery teams leverage RPO administrative services based in India. Their integrated solution is highly scalable and flexible, which allows for the cost effective outsourcing of all or a subset of skill categories across a series of recruitment processes. The Aon Hewitt RPO global operations will be integrated into PeopleScout, our existing RPO operations, in 2016. This acquisition advances the PeopleScout strategy to become the leading global RPO provider. We operate as two reportable segments: Staffing Services and Managed Services. Financial information regarding our reportable segments is included in Note 18: Segment Information, to our Consolidated Financial Statements found in Part II Item 8 of this Annual Report on Form 10-K.
aviation and transportation mechanics and technicians, and drivers as well as on-premise staffing and management of a facility's contingent blue-collar workforce. Staffing Services helped approximately 130,000 businesses in 2015 to be more productive by providing easy access to dependable blue-collar contingent labor and workforce solutions. Through our Staffing Services, we connect over 500,000 people with work each year. We service a broad range of industries that include construction, energy, manufacturing, warehousing, distribution, waste, wholesale, retail, transportation, aviation, hospitality, and many more. We have a network of 698 branches across all 50 states, Puerto Rico, and Canada, as well as 206 on-premise locations at customers' facilities. Staff Management | SMX ("Staff Management") for on-premise staffing and management of a facility's contingent workforce for manufacturing, assembly, and logistics. Newly acquired SIMOS will expand our on-premise contingent workforce staffing and management operations for warehousing and distribution. Use innovative technology to improve our ability to recruit quality workers, effectively match workers to the needs of our customers, manage our contingent workforce, and meet our customers' needs to efficiently and effectively improve productivity. Our long-term financial performance expectations of all our staffing service lines are similar as are the underlying financial and economic metrics used to manage those service lines. Profitable growth is driven by leveraging across all service lines our investment in technology to source, recruit, and connect workers with customers; our investments in technology that improve our productivity; and our cost structure to achieve economies of scale.We are focused on continuous analysis and improvement of our processes to enhance the ease and effectiveness of doing business with us for both our customers and workers. The staffing industry supplies contingent worker services to minimize the cost and effort of hiring and managing permanent employees. This allows for rapid response to changes in business conditions through the ability to temporarily replace absent employees, temporarily fill new positions, and convert fixed or permanent labor costs to variable costs. Staffing companies act as intermediaries in matching available contingent workers to employer work assignments. The work assignments vary widely in duration, level of skill, and required experience. The staffing industry is large and highly fragmented with many competing companies. No single company has a dominant share of the industry. Staffing companies compete both to recruit and retain a supply of contingent workers and to attract and retain customers who will employ these workers. Customer demand for contingent staffing services is dependent on the overall strength of the labor market and workforce flexibility trends. The staffing industry is subject to volatility based on overall economic conditions. Historically, in periods of economic growth, the number of companies providing contingent labor services has increased due to low barriers to entry whereas during recessionary periods, the number of companies has decreased through consolidation, bankruptcies, or other events. The staffing industry is currently experiencing increased demand in relation to total job growth as demand for a flexible workforce continues to grow with competitive and economic pressures to reduce costs and respond to rapidly changing market conditions. Managed Services includes outsourced service offerings in permanent employment recruitment process outsourcing ("RPO") and management of contingent labor services providers ("MSP"). PeopleScout provides RPO solutions. RPO is high-volume sourcing, screening, and recruitment of permanent employees for all major industries and jobs. The RPO solution delivers improved talent quality, faster hiring, increased scalability, reduced turnover, lower cost of recruitment, greater flexibility, and increased compliance. We leverage our proprietary candidate applicant tracking systems, along with dedicated service delivery teams to work as an integrated partner with our customers in providing end-to-end talent acquisition services from sourcing candidates through on-boarding employees. The solution is highly scalable and flexible, allowing for outsourcing of all or a subset of skill categories across a series of recruitment process and on-boarding steps. Customer contracts are generally multi-year in duration and pricing is typically composed of a fee for each hire. Volume, job type, degree of recruiting difficulty, and number of recruiting process steps from sourcing to on-boarding factor into pricing. Our North American RPO services are delivered through our highly centralized operations in Chicago, Illinois together with customer on-site and virtual employee teams. The same is true for our Asia Pacific RPO services, which are centralized in Sydney, Australia. In 2015, PeopleScout placed over 250,000 individuals into permanent jobs with 60 customers. Our commitment to superior customer service is key to our high customer retention. Effective January 4, 2016, we acquired Aon Hewitt’s RPO business, a leading provider of RPO services to meet their client’s permanent recruiting needs. The acquired operations expand and complement the PeopleScout operations. This acquisition further positions PeopleScout as a leading global RPO provider. PeopleScout’s global headquarters remain in Chicago, Illinois, with Asia Pacific headquarters in Sydney, Australia and global RPO administrative process services in New Delhi, India. Managed Services also includes our MSP service, which manages our customer's overall contingent labor program including vendor selection, vendor performance management, vendor compliance monitoring and risk management, and reducing vendor costs. As the customer's exclusive MSP service provider, we manage multiple workforce vendors utilizing vendor management systems. The human resource outsourcing industry involves transitioning various functions handled by internal human resources and labor procurement to outside service providers on a permanent or selective basis. Human resource outsourcing companies allow customers to shed non-core activities in order to reduce costs, free up management time and energy, and gain access to the high-quality services of specialty providers. Human resource departments are continually faced with increased operational complexity, heightened regulatory requirements and pressure to achieve cost savings, which increase the need to migrate non-core functions to outsourced providers. RPO and MSP services are in the early stages of their adoption cycles, and therefore, we believe they have significant growth potential. Cost: The majority of customers are able to reduce costs associated with their internal human resource cost structure by deploying an RPO solution for some or all of their recruiting needs. Companies are increasingly viewing RPO as an attractive and cost effective alternative to contingent search firms. Scalability: RPO providers can add significant scalability to a company's recruiting and hiring efforts, including accommodating seasonal, irregular, and burst hiring without being overstaffed during less busy periods. Providers also help customers increase efficiency by standardizing processes and facilitating transitions for candidates and employees. Access to Talent: RPO programs can access numerous sources to prospect for the best talent more quickly, thereby delivering a better outcome for the customer. RPO solutions are typically able to source higher quality candidates well suited to the position, leading to a lower turnover rate. RPO offers technology-enabled recruiting to address the rapidly changing employment demographics, shortage of skilled professional workers, and dynamic changes to how workers connect to work opportunities. Vendor Consolidation: As an organization's spend on contingent workforces rises, it becomes increasingly interested in reducing the administrative burden of managing multiple outside vendors, having consistency among contractors and processes, and maintaining robust performance tracking and analytics. Access to Talent: An MSP solution allows a company access to a large variety of vendors with the efficiency of working with one supplier. An MSP can access numerous vendors to find the best talent at the best price more quickly, thereby delivering a better outcome for the customer. Cost Savings: Vendor consolidation can achieve significant efficiencies through enhanced scale and cost advantages such as single point of contact, standardized contracts, and consolidated invoicing and reporting. MSP programs achieve cost savings through economies of scale with suppliers that would not be obtainable otherwise. Compliance Pressure: Demand for contingent employee sourcing and workforce management solutions is driven by increasing work eligibility legislation, and compliance monitoring to ensure correct worker classification in order to properly address tax withholding, overtime, Social Security, unemployment, and healthcare obligations to avoid government penalties and lawsuits. Our MSP solution addresses these needs. Market leadership through organic growth of our specialized workforce solutions. The addition of Seaton and the expansion of our services with the acquisition of the SIMOS on-premise workforce management solutions and the Aon Hewitt RPO services added new services and capabilities to better meet our objective of providing customers with the talent and flexible workforce solutions they need to enhance business performance. We remain committed to building the specialization of our sales, recruiting, and service teams, while creating a more seamless experience for our customers to access all of our services with more comprehensive solutions to enhance their performance and our growth. Our service lines offer complementary workforce solutions with unique value propositions to meet our customers' demand for talent. We remain committed to advancing the use of mobile technology in sourcing and connecting talent to customers and meeting their need for both contingent and permanent employee workforce solutions. We expect that mobile technology and digitizing our business model will differentiate us from the competition and allow us to provide greater access to high-quality talent, connect that talent with our customers, and meet our customers' needs for both contingent workers and permanent employees. It will also lower the cost of our delivery model. locations, expanded use of existing locations to provide the full range of blue-collar staffing services, centralized recruitment, and dispatch of our contingent workers to areas without branches. Our MSP solution is focused on domestic middle market companies with a growing dependence on contingent labor. We are uniquely positioned to supply blue-collar contingent workers to our customers and with our MSP solution to manage the full range of their contingent labor needs. We are recognized as an industry leader for RPO services. RPO services are in the early stages of their adoption cycle and therefore we believe they have significant growth potential. The success of early adopters is generating greater opportunity to expand our service offering. We have a differentiated service that leverages innovative technology for high-volume sourcing and dedicated client service teams for connecting people to opportunities. We have a track record of helping our customers reduce the cost of hiring, adding significant scalability to recruiting and hiring, and accessing numerous sources to prospect for the best talent quickly, thereby delivering a better outcome for the customer. Companies are facing rapidly changing employment demographics, shortage of talent, and dynamic changes to how people connect to work opportunities. Our solution addresses these growing challenges. Global companies are looking for global solutions. The addition of the Aon Hewitt RPO services will accelerate our global expansion of RPO services. Leverage technology to improve the contingent worker and customer experience and our efficiency. We are committed to technology innovation that makes it easier for our customers to do business with us and easier to connect workers to work opportunities. We are making significant investments in online and mobile applications to improve the access, speed, and ease of connecting our customers and workers. We will continue to invest in technology that increases our sustainability, scalability, and agility. These investments improve the efficiency and effectiveness of delivering our service. We expect to be the service leader, and we believe that the combination of our technology in the hands of our dedicated service teams differentiates our service. Growth through expansion into complementary workforce services. Our customers utilize our workforce solutions to improve the performance of their businesses. With growing demand for improved productivity and connecting to workers, our customers are looking for a full range of services. We are well positioned to offer additional complementary human capital solutions to help our customers achieve further optimization of their workforce. We expect to leverage our access to workers, innovative technology, and customer relationships to offer tailored solutions that expand our core services, offer greater access to talent and talent acquisition. Growth through acquisitions, which enhance our organic growth and technology advances. Strategic acquisitions continue to be a key growth strategy. We believe we have a core competence in assessing, valuing, and integrating acquisitions culminating in higher shareholder returns. We are excited about the future of the staffing industry and human resource outsourcing and believe we can continue to create shareholder value through acquisitions, which expand our workforce solutions in high-growth markets, enhance our use of technology to better serve our customers, and increase our own efficiency. Our customers range from small and medium-sized businesses to Fortune 100 companies. During 2015, we served approximately 130,000 customers in industries including construction, energy, manufacturing, warehousing, distribution, waste, wholesale, retail, transportation, aviation, hospitality, and many more. Our ten largest customers accounted for 25.5% of total revenue for 2015, 19.4% for 2014, and 15.7% for 2013. For the fiscal year ended 2015, one customer, Amazon, represented 13.1% and 13.7% of total Company and the Staffing Services reportable segment revenues, respectively. For the fiscal year ended 2015, two customers represented 10.6% and 10.2% of our Managed Services reportable segment revenue, respectively. For the fiscal years ended 2014 and 2013, no single customer represented more than 10% of total Company or the reported segment revenues. As of December 25, 2015, we employed approximately 5,500 full-time equivalent employees. Our Staffing Services placed over 500,000 contingent workers on assignments with our customers during 2015. We recruit contingent workers daily so that we can be responsive to the planned, as well as unplanned, needs of the customers we serve. We attract our pool of contingent workers through online resources, extensive internal databases, advertising, job fairs, and various other methods. We identify the skills, knowledge, abilities, and personal characteristics of a contingent worker and match their competencies and capabilities to a customer’s requirements. This enables our customers to obtain immediate value by placing a highly productive employee on the job site. We use a variety of proprietary programs and methods for identifying and assessing the skill level of our contingent workers when selecting a particular individual for a specific assignment and retaining those workers for future assignments. We believe that our programs and methods enable us to offer a higher quality of service by increasing productivity, decreasing turnover, and reducing absenteeism. We provide a bridge to permanent, full-time employment for thousands of contingent workers each year. Workers also come to us because of the flexibility we offer to fill a short-term financial need and/or provide longer-term contingent labor opportunities. Workers may be assigned to different jobs and job sites, and their assignments could last for as little as a few hours or extend for several weeks or months. We provide our workers meaningful work and the opportunity to improve their skills. We are considered the legal employer of our workers, and laws regulating the employment relationship are applicable to our operations. We consider our relations with our contingent workers to be good. The strongest staffing services competitor in a particular market is a company with established relationships and a track record of meeting the customer's needs. We compete with other large publicly-held staffing companies as well as privately-owned staffing companies on a national, regional, and local level. We also experience competition from internet-based companies providing a variety of flexible workforce solutions. Competition exists in attracting customers as well as qualified contingent workers for our customers. No single company has a dominant share of the industry. Competitive forces have historically limited our ability to raise our prices to immediately and fully offset increased costs of doing business, some of which include increased contingent worker wages, costs for workers’ compensation, unemployment insurance, and health care. The most significant competitive factors are price, ability to promptly fill customer orders, success in meeting customers’ expectations of recruiting contingent workers, and appropriately addressing customer service issues. We believe we derive a competitive advantage from our service history, and our specialized approach in serving the industries of our customers. Our national presence, industry specialization, investment in technology and proprietary systems, and processes together with specialized programs focused on worker safety, risk management, and legal and regulatory compliance are key differentiators from many of our competitors. The strongest competitors are companies specializing in RPO services and business services companies that also offer RPO services. No one provider dominates the market. Competition also includes internal human resource departments that have not or are not considering outsourcing. The most significant competitive factors for RPO services are the ability to reduce customer cost by deploying an RPO solution and reducing the internal human resource cost structure of our customers. The ability to add significant scalability to a customer's recruiting and hiring efforts, including accommodating seasonal and irregular hiring; the ability to increase efficiency by standardizing processes and facilitating transitions for candidates and employees; and the ability to source the most attractive talent at the best price are all important. Our tailored solutions, customer partnership, proprietary technology, and service delivery are key differentiators from many of our competitors. MSPs generally compete with internal contingent labor procurement, companies specializing in MSP services, and business services companies that also offer MSP services. The most significant competitive factors for outsourcing MSP services are vendor consolidation, compliance pressure, cost savings, access to diverse talent pools, and sophisticated deployment and monitoring. The workforce solutions business has historically been cyclical, often acting as an indicator of both economic downturns and upswings. Customers tend to use contingent workers to supplement their existing workforce and generally hire permanent workers when long-term demand is expected to increase. As a consequence, our revenues tend to increase quickly when the economy begins to grow. Conversely, our revenues also decrease quickly when the economy begins to weaken and thus temporary staff positions are eliminated, permanent hiring is frozen, and turnover replacement diminishes. Our business experiences seasonal fluctuations for staffing services. Demand is lower during the first and second quarters, in part due to limitations to outside work during the winter months and slowdown in manufacturing and logistics after the holiday season. Our working capital requirements are primarily driven by contingent worker payroll and customer accounts receivable. Since receipts from customers lag payroll to contingent workers, working capital requirements increase substantially in periods of growth. Demand for contingent labor peaks during the third quarter for outdoor work and the fourth quarter for manufacturing, assembly, warehousing, distribution and logistics for the holiday season. Our services are subject to a variety of complex federal and state laws and regulations. We continuously monitor legislation and regulatory changes for their potential effect on our business. We invest in technology and process improvements to implement required changes while minimizing the impact to our operating efficiency and effectiveness. Regulatory cost increases are passed through to our customers to the fullest extent possible. We have developed an integrated risk management program that focuses on loss analysis, education, and improvement programs to reduce our operational costs and risk exposure. We regularly analyze our losses on labor matters and workers' compensation claims to identify trends. This allows us to focus our resources on those areas that may have the greatest impact on us, price our services appropriately, and adjust our sales and operational approach in these areas. We have also developed educational materials for distribution to our customers and workers to address specific safety risks unique to their industry. For information regarding revenue from operations and long-lived assets by domestic and foreign operations, please refer to the information presented in Note 18: Segment Information, to our Consolidated Financial Statements found in Part II Item 8 of this Annual Report on Form 10-K.
Our Annual Report on Form 10-K, along with all other reports and amendments filed with or furnished to the Securities and Exchange Commission (“SEC”) are publicly available, free of charge, on our website at www.trueblue.com or at www.sec.gov as soon as reasonably practicable after such reports are filed with, or furnished to, the SEC. Our Corporate Governance Guidelines, Code of Business Conduct and Ethics, and Board Committee Charters are also posted to our website. The information on our website is not part of this or any other report we file with, or furnish to, the SEC. Investing in our securities involves risk. The following risk factors and all other information set forth in this Annual Report on Form 10-K should be considered in evaluating our future prospects. If any of the events described below occurs, our business, financial condition, results of operations, liquidity, or access to the capital markets could be materially and adversely affected. Our workforce solutions and services are significantly affected by fluctuations in general economic conditions. The demand for workforce solutions and services is highly dependent upon the state of the economy and upon the workforce needs of our customers, which creates uncertainty and volatility. As economic activity slows, companies tend to reduce their use of contingent workers and reduce their recruitment of new employees. Significant declines in demand of any region or specific industry in which we have a major presence may severely reduce the demand for our services, and thereby, significantly decrease our revenues and profits. Deterioration in economic conditions or the financial or credit markets could also have adverse impacts on our customers' ability to pay us for services we have already provided. It is difficult for us to forecast future demand for our services due to the inherent difficulty in forecasting the direction and strength of economic cycles and the project nature of our staffing assignments. This situation can be exacerbated by uncertain and volatile economic conditions, which may cause clients to reduce or defer projects for which they utilize our services, thereby negatively affecting demand for them. When it is difficult for us to accurately forecast future demand, we may not be able to determine the optimal level of personnel and investment necessary to profitably take advantage of growth opportunities. Our workforce solutions and services are subject to extensive government regulation, and the imposition of additional regulations could materially harm our future earnings. Our workforce solutions and services are subject to extensive regulation. The cost to comply, and any inability to comply with government regulation, could have a material adverse effect on our business and financial results. Increased government regulation of the workplace or of the employer-employee relationship, or judicial or administrative proceedings related to such regulation, could materially harm our business. Our staffing services employ contingent workers. The wage rates we pay to contingent workers are based on many factors, including government-mandated minimum wage requirements, payroll taxes, and benefits. These mandates are often difficult and expensive to comply with. If we are unable to comply with such mandates, or are not able to increase the fees charged to customers to absorb any increased costs related to government-mandated minimum wages, sick leave, payroll-related taxes, and benefits, our results of operations and financial condition could be adversely affected. We offer our contingent workers in the United States government-mandated health insurance in compliance with the Patient Protection and Affordable Care Act and the Health Care and Education Reconciliation Act of 2010 (collectively, the “ACA”). Because the requirements, regulations, and legislation related to the ACA may change, the full financial effect of the ACA is not yet known, and additional requirements, regulations, or legislative changes could increase our costs. If we are unable to comply with such additional changes, or sufficiently raise the rates we charge our customers to cover any additional costs, such increases in costs could materially harm our business. We may incur employment related claims and costs that could materially harm our business. We are in the business of employing people and placing them in the workplaces of other businesses. We incur a risk of liability for claims for personal injury, wage and hour violations, immigration, discrimination, harassment, and other liabilities arising from the actions of our customers and contingent workers. Some or all of these claims may give rise to negative publicity and/or litigation, including class action litigation. A material adverse impact on our financial statements could occur for the period in which the effect of an unfavorable final outcome becomes probable and can be reasonably estimated. We maintain insurance with respect to certain claims and costs. We cannot be certain that our insurance will be available, or if available, will be in sufficient amount or scope to cover all claims that may be asserted against us. Should the ultimate judgments or settlements exceed our insurance coverage, they could have a material effect on our business. We cannot be certain we will be able to obtain appropriate types or levels of insurance in the future, that adequate replacement policies will be available on acceptable terms, or at all, or that the companies from which we have obtained insurance will be able to pay claims we make under such policies. We are dependent on workers' compensation insurance coverage at commercially reasonable terms. Unexpected changes in claim trends on our workers' compensation may negatively impact our financial condition. require us to collateralize a significant portion of our workers' compensation obligation. The majority of collateral is held in trust by a third-party for the payment of these claims. The loss or decline in value of the collateral could require us to seek additional sources of capital to pay our workers' compensation claims. We cannot be certain we will be able to obtain appropriate types or levels of insurance in the future or that adequate replacement policies will be available on acceptable terms. As our business grows, or if our financial results deteriorate, the amount of collateral required will likely increase and the timing of providing collateral could be accelerated. Resources to meet these requirements may not be available. The loss of our workers' compensation insurance coverage would prevent us from doing business in the majority of our markets. Further, we cannot be certain that our current and former insurance carriers will be able to pay claims we make under such policies. We self-insure, or otherwise bear financial responsibility for, a significant portion of expected losses under our workers' compensation program. Unexpected changes in claim trends, including the severity and frequency of claims, changes in state laws regarding benefit levels and allowable claims, actuarial estimates, or medical cost inflation, could result in costs that are significantly different than initially reported. There can be no assurance that we will be able to increase the fees charged to our customers in a timely manner and in a sufficient amount to cover increased costs as a result of any changes in claims-related liabilities. We actively manage the safety of our workforce with our safety programs and actively control costs with our network of workers’ compensation related service providers. These activities have had a positive impact creating favorable adjustments to workers’ compensation liabilities recorded in prior periods. The benefit of these adjustments has been declining and there can be no assurance that we will be able to continue to reduce accident rates and control costs to produce these results in the future. Our level of debt and restrictions in our credit agreement could negatively affect our operations and limit our liquidity and our ability to react to changes in the economy. Extensions of credit under our Second Amended and Restated Revolving Credit Agreement ("Revolving Credit Facility") are permitted based on a borrowing base, which is an agreed percentage of eligible accounts receivable and an agreed percentage of the appraised value of our Tacoma headquarters building, less required reserves and other adjustments. If the amount or quality of our accounts receivable deteriorates, then our ability to borrow under the Revolving Credit Facility will be directly affected. Our lenders can impose additional conditions which may reduce the amounts available to us under the Revolving Credit Facility. Our principal sources of liquidity are funds generated from operating activities, available cash and cash equivalents, and borrowings under our Revolving Credit Facility. We must have sufficient sources of liquidity to meet our working capital requirements, fund our workers' compensation collateral requirements, service our outstanding indebtedness, and finance investment opportunities. Without sufficient liquidity, we could be forced to curtail our operations or we may not be able to pursue promising business opportunities. Our Revolving Credit Facility and Term Loan Agreement contain restrictive covenants that require us to maintain certain financial conditions. Our failure to comply with these restrictive covenants could result in an event of default, which, if not cured or waived, could result in our being required to repay these borrowings before their due date. We may not have sufficient funds on hand to repay these loans, and if we are forced to refinance these borrowings on less favorable terms, or are unable to refinance at all, our results of operations and financial condition could be materially adversely affected by increased costs and rates. Our increased debt levels could have significant consequences for the operation of our business, including: requiring us to dedicate a significant portion of our cash flow from operations to servicing our debt rather than using it for our operations; limiting our ability to obtain additional debt financing for future working capital, capital expenditures, or other corporate purposes; limiting our ability to take advantage of significant business opportunities, such as acquisition opportunities; limiting our ability to react to changes in market or industry conditions; and putting us at a disadvantage compared to competitors with less debt. Acquisitions and new business initiatives may have an adverse effect on our business. We expect to continue making acquisitions and entering into new business initiatives as part of our business strategy. This strategy may be impeded, however, if we cannot identify suitable acquisition candidates or new business initiatives, or if acquisition candidates are not available under terms that are acceptable to us. Future acquisitions could result in our incurring additional debt and contingent liabilities, an increase in interest expense, an increase in amortization expense, and/or significant charges related to integration costs. Acquisitions and new business initiatives, including initiatives outside of our workforce solutions and services business, could involve significant unanticipated challenges and risks, including that they may not advance our business strategy, we may not realize our anticipated return on our investment, we may experience difficulty in implementing initiatives or integrating acquired operations, or management's attention may be diverted from our other business. These events could cause material harm to our business, operating results, and/or financial condition. If our acquired intangible assets become impaired we may be required to record a significant charge to earnings. We regularly review acquired intangible assets for impairment when events or changes in circumstances indicate that the carrying value may not be recoverable. We test goodwill and indefinite-lived intangible assets for impairment at least annually. Factors that may be considered a change in circumstances, indicating that the carrying value of the intangible assets may not be recoverable, include: macroeconomic conditions, such as deterioration in general economic conditions; industry and market considerations, such as deterioration in the environment in which we operate; cost factors, such as increases in labor or other costs that have a negative effect on earnings and cash flows; our financial performance, such as negative or declining cash flows or a decline in actual or planned revenue or earnings compared with actual and projected results of relevant prior periods; and other relevant entity-specific events, such as changes in management, key personnel, strategy, or customers, and sustained decreases in share price. We may be required to record a significant charge in our financial statements during the period in which we determine an impairment of our acquired intangible assets has occurred, negatively impacting our financial results. We operate in a highly competitive and evolving market and may be unable to retain customers or market share. Our business is highly competitive and rapidly innovating. Our competitors include large, well-financed competitors, small local competitors, and internet-based companies providing a variety of flexible workforce solutions. We face extensive pricing pressure in all of our markets. Competing successfully depends in part on our ability to rapidly deliver innovative services and technologies to the marketplace. The process of developing and delivering new technologies and services is complex, costly, and uncertain. If we fail to anticipate the changing needs and technological trends relevant to our customers, contingent employees, or candidates, our market share and results of operations could suffer. Therefore, there can be no assurance that we will be able to retain customers or market share in the future. Nor can there be any assurance that we will, in light of competitive pressures, be able to remain profitable or, if profitable, maintain our current profit margins. The loss of, or substantial decline in, revenue from a major customer could have a material adverse effect on our revenues, profitability, and liquidity. We experience revenue concentration with large customers. The loss of, or reduced demand for, our services related to major customers could have a material adverse effect on our business, financial condition, and results of operations. In addition, customer concentration exposes us to concentrated credit risk, as a significant portion of our accounts receivable may be from a small number of customers. Our management information systems may not perform as anticipated and are vulnerable to damage and interruption. The efficient operation of our business is dependent on our technology and information systems. We rely heavily on proprietary and third-party management information systems, mobile device technology and related services, and other technology which may not yield the intended results. Our systems may experience problems with functionality and associated delays. The failure of our systems to perform as we anticipate could disrupt our business and could result in decreased revenue and increased overhead costs, causing our business and results of operations to suffer materially. Our primary computer systems and operations are vulnerable to damage or interruption from power outages, computer and telecommunications failures, computer viruses, security breaches, catastrophic events, and errors in usage by our employees. Failure of our systems to perform may require significant additional capital and management resources to resolve, causing material harm to our business. A data breach, or other improper disclosure of, or access to, our confidential and/or proprietary information or our employees' or customers' information could materially harm our business. Our business involves the use, storage, and transmission of information about applicants, candidates, contingent workers, permanent placements, our employees, and customers. Our contingent workers and employees may have access or exposure to confidential customer information about applicants, candidates, contingent workers, permanent placements, other employees, and our customers' businesses. We and our third-party vendors have established policies and procedures to help protect the security and privacy of this information. The secure use, storage, and transmission of this information is critical to our business operations. We have experienced cyber-attacks, computer viruses, social engineering schemes, and other means of unauthorized access to our systems. The security controls over sensitive or confidential information and other practices we and our third-party vendors follow may not prevent the improper access to, disclosure of, or loss of such information. Failure to protect the integrity and security of such confidential and/or proprietary information could expose us to regulatory fines, litigation, contractual liability, damage to our reputation, and increased compliance costs. Our results of operations could materially deteriorate if we fail to attract, develop, and retain qualified employees. and engaged employees. Our success depends upon our ability to attract, develop, and retain a sufficient number of qualified employees, including management, sales, recruiting, service, and administrative personnel. The turnover rate in the employment services industry is high, and qualified individuals of the requisite caliber and number needed to fill these positions may be in short supply. Our inability to recruit, train, and motivate a sufficient number of qualified individuals may delay or affect the speed of our strategy execution and planned growth. Delayed expansion, significant increases in employee turnover rates, or significant increases in labor costs could have a material adverse effect on our business, financial condition, and/or results of operations. We may be unable to attract sufficient qualified candidates to meet the needs of our customers. We compete to meet our customers' needs for workforce solutions and services and we must continually attract qualified candidates to fill positions. Attracting qualified candidates depends on factors such as desirability of the assignment, location, and the associated wages and other benefits. We have in the past experienced shortages of qualified candidates and we may experience such shortages in the future. Further, if there is a shortage, the cost to employ these individuals could increase. If we are unable to pass those costs through to our customers, it could materially and adversely affect our business. Organized labor periodically engages in efforts to represent various groups of our contingent workers. If we are subject to unreasonable collective bargaining agreements or work disruptions, our business could be adversely affected. We may have additional tax liabilities that exceed our estimates. We are subject to federal taxes and a multitude of state and local taxes in the United States and taxes in foreign jurisdictions. In the ordinary course of our business, there are transactions and calculations where the ultimate tax determination is uncertain. As we increase our international operations, we anticipate increasing accumulation of earnings outside of the United States, which may be subject to foreign taxation or additional taxation if these funds are returned to the United States. We are regularly subject to audit by tax authorities. Although we believe our tax estimates are reasonable, the final determination of tax audits and any related litigation could be materially different from our historical tax provisions and accruals. The results of an audit or litigation could materially harm our business. If our management is unable to certify the effectiveness of our internal controls, our independent registered public accounting firm cannot render an opinion on the effectiveness of our internal control over financial reporting, or material weaknesses in our internal controls are identified, we could be subject to regulatory scrutiny and a loss of public confidence. In addition, if we do not maintain adequate financial and management personnel, processes and controls, we may not be able to accurately report our financial performance on a timely basis, which could cause our stock price to fall. Outsourcing certain aspects of our business could result in disruption and increased costs. We have outsourced certain aspects of our business to third-party vendors that subject us to risks, including disruptions in our business and increased costs. For example, we have engaged third parties to host and manage certain aspects of our data center, information and technology infrastructure, mobile texting and electronic pay solutions, to provide certain back office support activities, and to support business process outsourcing for our customers. Accordingly, we are subject to the risks associated with the vendors' ability to provide these services to meet our needs. If the cost of these services is more than expected, or if we or the vendors are unable to adequately protect our data and information is lost, or our ability to deliver our services is interrupted, then our business and results of operations may be negatively impacted. Foreign currency fluctuations may have a material adverse effect on our operating results. We report our results of operations in United States dollars. The majority of our revenues are generated in the United States. Our international operations are denominated in currencies other than the United States dollar, and unfavorable fluctuations in foreign currency exchange rates could have a adverse effect on our reported financial results. Increases or decreases in the value of the United States dollar against other major currencies could affect our revenues, operating profit, and the value of balance sheet items denominated in foreign currencies. Our exposure to foreign currencies, in particular the Australian dollar, could have an adverse effect on our business, financial condition, cash flow, and/or results of operations. Furthermore, the volatility of currencies may impact year-over-year comparability. We lease the building space at all our branches and other offices except for one that we own in Florida. Under the majority of the branch leases, we have the right to terminate the lease on 90 days' notice. We own an office building in Tacoma, Washington, which serves as our corporate headquarters. Management believes all our facilities are currently suitable for their intended use. See Note 10: Commitments and Contingencies, to our Consolidated Financial Statements found in Part II of Item 8 of this Annual Report on Form 10-K.
No cash dividends have been declared on our common stock to date nor have any decisions been made to pay a dividend in the future. Payment of dividends is evaluated on a periodic basis and if a dividend were paid, it would be subject to the covenants of our Second Amended and Restated Revolving Credit Agreement, which may have the effect of restricting our ability to pay dividends. The table below includes repurchases of our common stock pursuant to publicly announced plans or programs and those not made pursuant to publicly announced plans or programs during the thirteen weeks ended December 25, 2015. During the thirteen weeks ended December 25, 2015, we purchased 5,552 shares in order to satisfy employee tax withholding obligations upon the vesting of restricted stock. These shares were not acquired pursuant to any publicly announced purchase plan or program. Weighted average price paid per share does not include any adjustments for commissions. Our Board of Directors authorized a $75.0 million share repurchase program in July 2011 that does not have an expiration date. As of December 25, 2015, $35.2 million remains available for repurchase of our common stock under the current authorization. 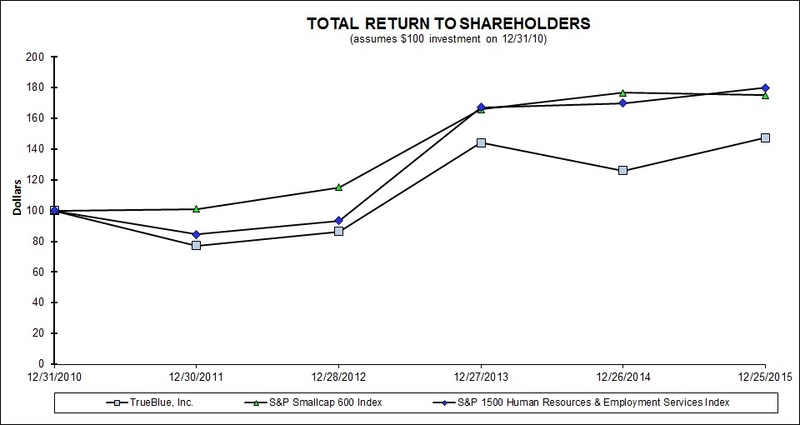 The following graph depicts our stock price performance from December 31, 2010 through December 25, 2015, relative to the performance of the S&P SmallCap 600 Index and S&P 1500 Human Resources and Employment Services Index. All indices shown in the graph have been reset to a base of 100 as of December 31, 2010 and assume an investment of $100 on that date and the reinvestment of dividends, if any, paid since that date. The following selected financial data is derived from our audited Consolidated Financial Statements. The data below should be read in conjunction with Item 1A. Risk Factors, Item 7. Management’s Discussion and Analysis of Financial Condition and Results of Operations, and Item 8. Financial Statements and Supplementary Data of this Annual Report on Form 10-K. The operating results reported above include the results of acquisitions subsequent to their respective purchase dates. In December 2015, we acquired SIMOS Insourcing Solutions Corporation. In June 2014, we acquired all of the outstanding equity interests of Staffing Solutions Holdings, Inc. In February 2013, we acquired substantially all of the assets and assumed certain liabilities of MDT Personnel, LLC. In October 2013, we acquired substantially all of the assets and assumed certain liabilities of The Work Connection, Inc.
Management’s Discussion and Analysis of Financial Condition and Results of Operations (“MD&A”) is designed to provide the reader of our financial statements with a narrative from the perspective of management on our financial condition, results of operations, liquidity and certain other factors that may affect future results. MD&A is provided as a supplement to, and should be read in conjunction with, our consolidated financial statements and the accompanying notes to our financial statements. TrueBlue, Inc. is a leading provider of specialized workforce solutions helping clients improve growth and performance by providing staffing, recruitment process outsourcing, and managed service provider solutions. Our workforce solutions meet clients’ needs for a reliable, efficient workforce in a wide variety of industries. Through our workforce solutions, we help approximately 130,000 businesses to be more productive and we connect approximately 750,000 people to work each year. We are headquartered in Tacoma, Washington. The year ended December 25, 2015 included a full year of Staffing Solutions Holdings, Inc. ("Seaton") revenue of $810.8 million or 18.1% of our revenue growth or 15.8% excluding organic revenue growth. The Seaton acquisition was completed in the prior year, effective June 30, 2014, the first business day of the third quarter. Revenue was $394.4 million from the date of acquisition through our year ended December 26, 2014. The acquisition of Seaton added full service lines for on-premise staffing for large scale exclusive sourcing, screening, recruitment, and management of a customer's on-premise contingent labor workforce; recruitment process outsourcing for high-volume sourcing, screening, and recruiting of permanent employees for all major industries and jobs; and managed service provider solutions, which provides customers with improved quality and spend management of their contingent labor vendors. In the first year of operations, Seaton delivered on our expectations for revenue and income from operations, and continues to deliver organic revenue growth. Organic revenue growth for the year ended December 25, 2015 was 7.2%. Quarterly year over year organic revenue growth was 0.4% for the first quarter, 1.4% for the second quarter, 8.0% for the third quarter, and 14.1% for the fourth quarter. The annual and accelerating quarterly organic revenue growth was driven by widespread improvement across most of our service lines, geographies, and the industries we serve. The construction industry saw considerable growth driven by improving momentum in both residential and commercial construction as well as green energy projects. Rapid growth in online commerce resulted in considerable growth in warehousing and distribution. Demand by the transportation industry for our driver workforce solutions continues to see double digit growth. We saw improving trends with small to medium sized customers and continued growth with our national customers. The positive trends are partially offset by continued pressure on the manufacturing industry, which continues to face a challenging export market. Effective December 1, 2015, we acquired SIMOS Insourcing Solutions (“SIMOS”), a leading provider of on-premise workforce management solutions. SIMOS specializes in helping clients streamline warehouse/distribution operations to meet the growing demand for online commerce and supply chain solutions. SIMOS will expand our existing services for on-premise staffing and management of a facility's contingent workforce. SIMOS contributed $22.2 million in revenue or 1.0% of our revenue growth for the fiscal year ended December 25, 2015. Gross profit as a percentage of revenue for the year ended December 25, 2015 was 23.6% compared to 24.7% for the same period in the prior year. The decline of 1.1 percentage points of revenue was largely due to the impact of the Seaton acquisition, which carried lower gross margins in comparison with the blended company average. This was partially offset by improved gross margin in our organic business through disciplined pricing and management of our increasing minimum wage for labor, health benefits, and payroll taxes. Selling, general and administrative ("SG&A") expenses as a percentage of revenue decreased to 18.4% for the year ended December 25, 2015 from 19.6% for the same period in 2014, primarily due to Seaton's lower cost of doing business as a percent of sales. The acquired service lines offer workforce solutions as an integrated partner with our customers, which are delivered through highly centralized operations in Chicago, Illinois with support from on-site and virtual employee teams. We do not operate a branch network to service these customers and accordingly these services utilize a more flexible centralized support structure resulting in lower SG&A as a percent of sales. million. We completed the acquisition of Seaton on the first business day of our third quarter of 2014. The integration of Seaton was completed during 2015. The remaining increase is primarily related to variable costs on organic revenue growth and other investments to enable continued growth. Depreciation and amortization increased $12.4 million for the year ended December 25, 2015, due to a full year of amortization of intangible assets acquired in connection with the Seaton acquisition compared to half a year of amortization expense in 2014. Income from operations grew to $97.8 million for the year ended December 25, 2015, or an increase of 19.7% compared to $81.7 million for the same period in 2014. The improved performance reflects solid revenue growth, disciplined pricing, and effective cost control partially offset by investments made in sales and recruiting resources as well as start-up costs for on-site customers and new recruitment process outsourcing customers. The benefit of those investments will be fully realized in 2016. Net income increased to $71.2 million, or $1.71 per diluted share, for the year ended December 25, 2015, compared to $65.7 million, or $1.59 per diluted share, for the same period in 2014. The increase was driven primarily by net income from acquired operations and organic growth. We believe we are in a strong financial position to fund working capital needs for growth opportunities. As of December 25, 2015, we had cash and cash equivalents of $29.8 million and $77.3 million available under the Revolving Credit Facility. Our year-over-year trends are significantly impacted by the acquisition of Seaton. Seaton was acquired effective the first day of our fiscal third quarter in 2014 and, accordingly, is included in only twenty-six of the fifty-two weeks ended December 26, 2014, as compared to the entire year ended December 25, 2015. The Seaton acquisition added new services and capabilities to better meet our objective of providing our customers with the talent and flexible workforce solutions they need to enhance their business performance. These service lines have dedicated customer on-site and virtual teams which leverage highly centralized support services for recruiting and delivering services to meet the specialized needs of each customer. Since these service lines do not operate a branch network, they can function more flexibly. The performance of the Seaton acquisition in the first year of operations has delivered on our expectations for revenue and income from operations and continues to deliver organic revenue growth. Effective December 1, 2015, we acquired SIMOS, a leading provider of on-premise workforce management solutions. SIMOS customers include Fortune 500 companies in consumer goods, retail, online commerce, and food packaging and distribution. SIMOS specializes in helping clients streamline warehouse/distribution operations to meet the growing demand for online commerce and supply chain solutions. They are also experts in providing scalable solutions for pick and pack and shipping requirements. Their unique productivity model incorporates fixed price-per-unit solutions to drive client value. Additionally, their continuous analysis and improvement of processes and incentive pay drives workforce efficiency and reduces costs, lowers risk of injury and damage, and improves productivity and service levels. SIMOS broadens our on-premise staffing footprint with an additional 37 sites across 11 states. Revenue grew to $2,695.7 million for fiscal 2015, a 24.0% increase compared to the same period in the prior year primarily due to the acquisitions of Seaton in the prior year and SIMOS in the current year. The year ended December 25, 2015 included a full year of revenue for Seaton of $810.8 million compared to $394.4 million from the date of acquisition through our year ended December 26, 2014, contributing 18.1% of our revenue growth, or 15.8% excluding organic revenue growth. The year ended December 25, 2015 included one month of SIMOS revenue of $22.2 million or 1.0% of our revenue growth over the prior year. Organic revenue growth for the year ended December 25, 2015 was 7.2%. Quarterly year-over-year organic revenue growth was 0.4% for the first quarter, 1.4% for the second quarter, 8.0% for the third quarter, and 14.1% for the fourth quarter. The annual and accelerating quarterly organic revenue growth was driven by widespread improvement across most of our service lines, geographies, and the industries we serve. The construction industry saw considerable growth driven by improving momentum in both residential and commercial construction as well as green energy projects. Rapid growth in online commerce resulted from considerable growth in warehousing and distribution. Demand by the transportation industry for our driver workforce solutions continues to see double digit growth.We saw improving trends with small to medium sized customers and continued growth with our national customers. The positive trends are partially offset by ongoing pressure on the manufacturing industry, which continues to face a challenging export market. The demand for our specialized workforce solutions remains strong as labor markets continue to tighten and our customers need our specialized solutions to find talent. Revenue grew to $2,174.0 million for fiscal 2014, a 30.3% increase compared to the same period in the prior year. The increase in revenue is primarily due to the acquisition of Seaton on June 30, 2014 and the acquisitions of MDT and TWC in 2013. Revenue for Seaton was $394.4 million for the period from the acquisition date to December 26, 2014 or 23.6% of our revenue growth. Approximately 4.6% of the revenue growth for fiscal 2014 was generated from the acquisitions of MDT and TWC due to the retention of senior management and strong retention of customers. Effective February 4, 2013, we acquired substantially all of the assets and assumed certain liabilities of MDT, the third-largest general labor staffing provider in the United States. MDT supplied blue-collar labor to industries similar to those served by TrueBlue, including construction, event staffing, disaster recovery, hospitality, and manufacturing through its network of 105 branches in 25 states. MDT operations were primarily integrated with our Labor Ready service line. We consolidated 65 branch locations, blended our sales and service teams, and fully integrated all former MDT locations into our enterprise systems. The acquisition of MDT deepened our expertise and strengthened our position in the key industries we serve. The customers of MDT were fully integrated with our existing customer base and serviced by our blended operations. We completed the integration of all remaining administrative services during the second quarter of 2013. Due to full consolidation of the MDT branches, blending our sales and service teams, and fully integrating all former MDT locations into our enterprise systems, we cannot accurately segregate the acquisition revenue from our organic revenue growth. 2013. Revenue for TWC was approximately $81.3 million for the full year ended December 26, 2014 as compared to $24.0 million for the prior year from the date of acquisition. In addition to revenue growth from acquisitions, we experienced organic revenue growth for fiscal 2014 across many geographies and industries we serve of approximately 2.0%, or 4.2% excluding our services to the green energy industry. Green energy projects declined and slowed during 2014 as compared to 2013. Staffing revenue is recognized at the time the service is provided by the contingent employees. Revenue from permanent placement services is recognized at the time the permanent placement candidate begins full-time employment. Revenue from other staffing fee-based services is recognized when the services are provided. Revenue also includes billable travel and other reimbursable costs. Cost of services are costs directly associated with the earning of revenue and primarily includes wages and related payroll taxes and workers’ compensation expenses. Cost of services also includes billable travel as well as other reimbursable and non-reimbursable expenses. Gross profit as a percentage of revenue for fiscal 2015 was 23.6% compared to 24.7% for the same period in the prior year for a decline of 1.1 percentage points of revenue. The decline was largely due to the impact of the Seaton acquisition, which carried lower gross margins in comparison with the blended company average. This was partially offset by improved gross margin in our organic business through disciplined pricing and management of our increasing minimum wage for labor, health benefits, and payroll taxes. Workers’ compensation expense as a percentage of revenue was 3.6% for fiscal 2015 and 2014. We actively manage the safety of our workforce with our safety programs and control increasing costs with our network of workers' compensation service providers. These activities have had a positive impact of creating favorable adjustments to workers’ compensation liabilities recorded in prior periods. Continued favorable adjustments to our workers' compensation liabilities are dependent on our ability to continue to lower accident rates and costs of our claims. However, in line with our expectations, we are experiencing diminishing favorable adjustments to our workers' compensation liabilities as the opportunity for significant reduction to frequency and severity of accident rates diminishes. Gross profit as a percentage of revenue for fiscal 2014 was 24.7% compared to 26.5% for the same period in the prior year. This was primarily due to the acquisitions of Seaton, TWC, and MDT, which carried lower gross margins in comparison to our blended company average prior to the acquisitions. Excluding the impact of acquisitions on our blended company average, gross profit as a percentage of revenue improved through disciplined pricing and management of our temporary labor wages and payroll taxes. Workers’ compensation expense as a percentage of revenue was 3.6% for fiscal 2014, compared to 3.8%, for the same period in the prior year. The decline is due in part to the acquisition of Seaton and the lower cost of workers' compensation cost as a percentage of revenue due to the nature of their business. In addition, we actively manage the safety of our workforce with our safety programs and control increasing costs with our network of workers' compensation service providers. These actions have had a positive impact creating favorable adjustments to workers’ compensation liabilities recorded in prior periods. SG&A expenses as a percentage of revenue decreased to 18.4% for the year ended December 25, 2015, from 19.6% for the same period in 2014, primarily due to Seaton's lower cost of doing business as a percent of sales. The acquired service lines offer workforce solutions as an integrated partner with our customers, which are delivered through highly centralized operations in Chicago, Illinois with support from on-site and virtual employee teams. Since we do not operate a branch network to service customers, we are able to utilize a more flexible support structure that results in lower SG&A as a percent of sales. SG&A increased by $70.2 million to $496.0 million for the year ended December 25, 2015, compared to the same period in 2014. The increase is primarily related to a full year of the acquired operations of Seaton of approximately $55.8 million. We completed the acquisition of Seaton on the first business day of our third quarter of 2014. The integration of Seaton was completed during 2015. The remaining increase is primarily related to variable costs related to organic revenue growth and investments made in selling and recruiting resources for blue-collar staffing services as well as start-up costs for on-site customers and new recruitment process outsourcing customers. The benefit of those investments will be fully realized in 2016. SG&A spending increased $63.5 million to $425.8 million for fiscal 2014. The increase is primarily related to the acquired operations of Seaton of $43.2 million. We completed the acquisition of Seaton on the first business day of our third quarter of 2014. We incurred $5.2 million of costs related to our acquisition and integration of Seaton during fiscal 2014. The integration of Seaton was completed in 2015. SG&A spending also increased by approximately $11.0 million due to a full year of the MDT and TWC operations acquired in the prior year. We incurred non-recurring acquisition and integration costs for MDT and TWC of $7.4 million during fiscal 2013. The remaining increase is primarily due to variable SG&A expenses associated with organic revenue growth and continued investments in our strategy to align the dedicated sales, recruiting, and services of our branch-based service lines to better serve our customers, and enable further branch consolidation and centralization of services, which we believe will continue to increase our operating efficiency. We consolidated 65 branches during fiscal 2014 and expect to consolidate additional branches in the future. We expect further leverage benefit from branch consolidations in the future. Depreciation and amortization expense increased $12.4 million for fiscal 2015. The increase is primarily due to a full year of amortization expense for intangible assets acquired in connection with Seaton of $14.8 million and the depreciation of the fair value of acquired tangible assets compared to half a year of amortization expense in 2014. Depreciation and amortization increased $9.0 million for the year ended December 26, 2014 primarily due to the amortization of intangible assets acquired in connection with the Seaton acquisition on the first business day of our third quarter of 2014 and includes a full year related to MDT and TWC acquired in the prior year. Net interest expense for fiscal 2015 is primarily due to our Revolving Credit Facility balance of $218.1 million at December 25, 2015 compared to $172.0 million at December 26, 2014. The Revolving Credit Facility was used in the amount of $187.0 million for the purchase of Seaton in the prior year in addition to cash of $118.9 for a total purchase price of $305.9 million. The purchase of SIMOS in December 2015, in the amount of $67.5 million, was funded entirely from the Revolving Credit Facility. Net interest income for fiscal 2014 was $0.1 million compared to net interest income of $1.4 million over the same period in 2013. The decline in net interest income is due to lower cash investments as a result of cash used in the Seaton acquisition as well as increased interest expense on the use of our Revolving Credit Facility to acquire Seaton at the beginning of the third quarter. The estimate of our annual effective tax rate is subject to variation due to several factors including: variability in taxable income and loss and the mix of jurisdictions to which they relate, tax credits, audit developments, changes in law, regulations and administrative practices, and relative changes of expenses or losses for which tax benefits are not recognized. Additionally, our effective tax rate can be more or less volatile based on the amount of pre-tax income. For example, the impact of discrete items, tax credits and non-deductible expenses on our effective tax rate is greater when our pre-tax income is lower. Except as required under U.S. tax law, we do not provide for U.S. taxes on undistributed earnings of our foreign subsidiaries since we consider those earnings to be permanently invested outside of the U.S. The most significant driver of fluctuations in our effective income tax rate is the Work Opportunity Tax Credit (“WOTC”). WOTC is designed to encourage hiring of workers from certain disadvantaged targeted categories, and is generally calculated as a percentage of wages over a twelve month period up to worker maximum by targeted category. Based on historical results and business trends we estimate the amount of WOTC we expect to earn related to wages of the current year. However, the estimate is subject to variation because 1) a small percentage of our workers qualify for one or more of the many targeted categories; 2) the targeted categories are subject to different incentive credit rates and limitations; 3) credits fluctuate depending on economic conditions and qualified worker retention periods; and 4) state and federal offices often delay their credit certification processing from a few months to several years and have inconsistent certification rates. We recognize additional prior year hiring credits if credits in excess of original estimates have been certified by government offices. WOTC was retroactively restored from January 1, 2015 through December 31, 2019, as a result of the Protecting Americans from Tax Hikes Act of 2015, signed into law on December 18, 2015. The principal difference between our statutory federal income tax rate of 35% and the effective income tax rate is state and foreign income taxes, certain non-deductible expenses, and WOTC. Our effective income tax rate on earnings for fiscal 2015 was 26.1%, compared 19.8% for the same period in 2014. The increase in the effective income tax rate is primarily due to a $2.5 million reduction in tax benefits from hiring credits. The principal difference between our statutory federal income tax rate of 35% and the effective income tax rate is state and foreign income taxes, certain non-deductible expenses, and WOTC.Our effective tax rate on earnings for fiscal 2014 was 19.8% as compared to 26.3%, for the same period in 2013. The 6.5% decrease in the tax rate is primarily due to a $7.1 million increase in tax benefits from hiring credits. In the fourth quarter of 2014 we changed our organizational structure as a result of our acquisition of Seaton on June 30, 2014. Legacy TrueBlue operated within the staffing industry, providing contingent, industrial labor to customers, which we aggregated into one reportable segment in accordance with U.S. GAAP. The acquisition of Seaton added a full service line of on-premise contingent, industrial staffing. On-premise staffing is large scale sourcing, screening, recruiting, and management of the contingent labor workforce at a customer's facility. This service line is an operating segment which is aggregated with the legacy TrueBlue operations and reported as Staffing Services. Effective December 1, 2015, we acquired SIMOS, a leading provider of on-premise workforce management solutions. SIMOS broadens our on-premise staffing solution and is included in Staffing Services. The acquisition of Seaton also added complementary outsourced service offerings in recruitment process outsourcing and managed service provider solutions. Recruitment process outsourcing is high-volume sourcing, screening and recruitment of permanent employees for all major industries and jobs. Managed service provider solutions provide customers with improved quality and spend management of their contingent labor vendors. The complementary service lines are operating segments, which are aggregated and reported as Managed Services. Revenue grew to $2,591.2 million for fiscal 2015, a 21.9% increase compared to the same period in the prior year, primarily due to the acquisitions of Seaton in the prior year and SIMOS in the current year. The year ended December 25, 2015 included a full year of revenue for Seaton of $705.1 million compared to $346.3 million from the date of acquisition through our year ended December 26, 2014, or 15.9% of our revenue growth. The year ended December 25, 2015 included one month of SIMOS revenue of $22.2 million or 1.0% of our revenue growth over the prior year. Organic revenue growth for the year ended December 25, 2015 was 4.7%. The organic revenue growth was driven by widespread improvement across most of our staffing service lines, geographies, and the industries we serve. The construction industry saw considerable growth driven by improving momentum in both residential and commercial construction as well as green energy projects. Rapid growth in online commerce resulted in considerable growth in warehousing and distribution. Demand by the transportation industry for our driver workforce solutions continues to see double digit growth.We saw improving trends with small to medium sized customers and continued growth with our national customers. The positive trends are partially offset by continued pressure on the manufacturing industry, which continues to face a challenging export market. Income from operations as a percent of revenue decreased slightly to 6.4% the year ended December 25, 2015, compared to 6.5% for the same period in 2014. The decrease is primarily related to investments made in start-up costs for on-site customers and other investments to enable continued growth.We expect the the benefit of those investments to be fully realized in 2016. For the fiscal year ended 2015, one customer, Amazon, represented 13.1% and 13.7% of total Company and the Staffing Services reportable segment revenues, respectively. For the fiscal years ended 2014 and 2013, no single customer represented more than 10% of total Company. For fiscal year ended 2014, no single customer represented more than 10% of total Staffing Services reportable segment revenues. Managed service revenue and income from operations for the year ended December 25, 2015, include a full year of results for Seaton compared to partial year results from the acquisition date of June 30, 2014 through December 26, 2014. Income from operations as a percent of revenue decreased slightly to 11.8% for the year ended December 25, 2015, compared to 12.3% for the same period in 2014. The decrease is primarily related to investments made in start-up costs for new recruitment process outsourcing customers. For the fiscal year ended 2015, two customers represented 10.6% and 10.2% of our Managed Services reportable segment revenues, respectively. For the fiscal year ended 2014, no single customer represented more than 10% of Managed Services reportable segment revenues. Effective December 1, 2015, we acquired SIMOS, a leading provider of on-premise workforce management solutions. The acquired operations expand and complement our Staff Management | SMX on-premise services. We expect SIMOS to produce annual revenue of approximately $185 million, or 5.6% of total revenue growth, and operating income of approximately $9 million for fiscal 2016. Effective January 4, 2016, we acquired Aon Hewitt’s RPO business, a leading provider of recruitment process outsourcing services. The acquired operations expand and complement our PeopleScout services and will be fully integrated with this service line in 2016. We expect the acquired RPO business of Aon Hewitt to produce annual revenue of approximately $65 million, or 2.4% of total revenue growth, and operating income of approximately $10 million for fiscal 2016.
for our national customer base and retail industry, continued into January of 2016. We remain optimistic for fiscal 2016 with continued demand for our specialized workforce solutions in an increasingly tight labor market. We also expect demand to fluctuate in choppy patterns, as it has since emerging from the recession in 2010. Providing our customers with a scalable workforce is a key value proposition of our business model and we are well versed in our ability to respond by scaling our own cost structure. We expect operating income of approximately $133 million for fiscal 2016, or 4.2% as a percentage of revenue, as compared to 3.6% for 2015. Operating income for fiscal 2016 includes approximately $7 million of estimated non-recurring integration costs and $7 million of estimated incremental intangible asset amortization related to the acquisition of SIMOS and the RPO business of Aon Hewitt. We remain committed to technology innovation that makes it easier for our customers to do business with us and easier to connect people to work. We are investing in online and mobile applications to improve the access, speed, and ease of connecting our customers and workers. We will continue to invest in technology that increases our sustainability, scalability, and agility. These investments improve the efficiency and effectiveness of delivering our service and are reducing our dependence on local branches to process workers. Additionally, these investments advance our ability to centralize high-volume activities, which have increased the reliability of our service delivery and allowed our field personnel to focus on matching the customer's needs with the best solution to enhance their performance. Acquisitions will remain a key element of our growth strategy. We have a proven track record of successfully acquiring and integrating companies and believe we have a strong business competence to continue to do so. The following discussion highlights our cash flow activities for the years ended December 25, 2015, December 26, 2014, and December 27, 2013. An increase in net income of $5.6 million due to a combination of a full year of legacy Seaton results and legacy TrueBlue organic growth. An increase in accounts payable and other accrued expenses of $31.9 million, primarily due to organic revenue growth in the fourth quarter of 14.1% and timing of payments. Additionally, the prior year accounts payable and accrued expenses were lower due to accelerated vendor payments to facilitate the transition of Seaton to TrueBlue's ERP system. An increase in workers' compensation claims reserve ("reserve") of $13.2 million, primarily due to increased delivery of services. The reserve generally increases as our staffing services increase and decreases when staffing services decline. An increase in depreciation and amortization of $12.4 million due to a full year of amortization of acquired finite-lived intangible assets in connection with our acquisition of Seaton, as compared to half a year in 2014. An increase in accounts receivable of $11.8 million, primarily due to organic revenue growth in the fourth quarter of 14.1% compared to the same period in the prior year. An increase in income tax receivable of $11.0 million, primarily driven by restoring the Work Opportunity Tax Credit ("WOTC"). WOTC is designed to encourage the hiring of workers from certain disadvantaged targeted categories. The Protecting Americans from Tax Hikes Act was signed into law on December 18, 2015, which restored these WOTC benefits retrospectively from January 1, 2015. An increase in net income of $20.8 million, primarily due to the acquisition of Seaton. An increase in accounts receivable of $73.4 million, primarily due to revenue growth related to the acquisition of Seaton. Demand for Staff Management on-premise services is significantly higher during the fourth quarter in connection with manufacturing and distributing for the holiday season. Historically, legacy TrueBlue accounts receivable peaked in the third quarter and de-leveraged in the fourth quarter. An increase in deferred taxes of $16.5 million, primarily due to nondeductible intangibles acquired in connection with the acquisition of Seaton. Cash used in investing activities of $67.5 million in 2015 was for the acquisition of SIMOS. In the prior year, we acquired Seaton for $305.9 million. Restricted cash and investments consist primarily of collateral that has been provided or pledged to insurance carriers and state workers' compensation programs. Changes in restricted cash, cash equivalents, and investments increased to $20.6 million for the year ended December 25, 2015 compared to $14.8 million for the same period in the prior year. This increase in cash used in investing activities was primarily due to an increase in collateral requirements paid to our workers' compensation insurance providers due to both organic growth in operations and acquisitions. Net cash used in investing activities increased $193.2 million in 2014 as compared to 2013. Cash used in investing activities increased primarily due to the acquisition of Seaton for $305.9 million. We sold the majority of our marketable securities during the third quarter of 2014 to help fund our acquisition of Seaton. Restricted cash and investments consist primarily of collateral that has been provided or pledged to insurance carriers and state workers' compensation programs. Changes in restricted cash, cash equivalents, and investments increased by $14.8 million for fiscal 2014. This increase is primarily due to an increase in the collateral requirements by our workers' compensation insurance providers related to the acquisition of Seaton. Cash provided by financing activities decreased $127.0 million in 2015 as compared to 2014, primarily due to repayments made on our Revolving Credit Facility, net of the purchase of SIMOS. See Note 9: Long-term Debt, to our Consolidated Financial Statements found in Item 8 of this Annual Report on Form 10-K, for details of our Revolving Credit Facility. Cash provided by financing activities increased $137.4 million in 2014 as compared to 2013, primarily due to financing a portion of the Seaton acquisition with the Revolving Credit Facility in the amount of $187.0 million. See Note 2: Acquisitions and Note 9: Long-Term Debt, to our Consolidated Financial Statements found in Item 8 of this Annual Report on Form 10-K, for details of our Seaton acquisition and Revolving Credit Facility. On January 4, 2016, in connection with the acquisition of the RPO business of Aon Hewitt, we entered into a Third Amendment to the Second Amended and Restated Credit Agreement dated June 30, 2014. The Amendment provides for a temporary $30 million increase in our existing $300 million revolving line of credit, for a total of $330 million. The temporary increase will expire in $10 million increments on April 1, May 1, and June 1 of 2016. The Revolving Credit Facility is an asset-backed facility, which is secured by a pledge of substantially all of the assets of TrueBlue, Inc. and material U.S. domestic subsidiaries. The additional amount available to borrow at December 25, 2015 was $77.3 million. We believe the Revolving Credit Facility provides adequate borrowing capacity. We had cash and cash equivalents of $29.8 million at December 25, 2015. We expect to continue to apply excess cash towards the outstanding balance on our Revolving Credit Facility. Of the total cash and cash equivalents of $29.8 million, $5.7 million resides in our international subsidiaries. The majority of our workers’ compensation payments are made from restricted cash rather than cash from operations. At December 25, 2015, we had restricted cash and investments totaling $188.4 million. We believe that cash provided from operations and our capital resources will be adequate to meet our cash requirements for the foreseeable future. See Note 9: Long-term Debt, to our Consolidated Financial Statements found in Item 8 of this Annual Report on Form 10-K, for details of our Revolving Credit Facility. Restricted cash and investments consist principally of collateral that has been provided or pledged to insurance carriers for workers' compensation and state workers' compensation programs. Our insurance carriers and certain state workers' compensation programs require us to collateralize a portion of our workers' compensation obligation. We have agreements with certain financial institutions that allow us to restrict cash and cash equivalents and investments for the purpose of providing collateral instruments to our insurance carriers to satisfy workers' compensation claims. At December 25, 2015, we had restricted cash and investments totaling $188.4 million. The majority of our collateral obligations are held in a trust at the Bank of New York Mellon ("Trust"). We provide workers’ compensation insurance for our employees. The majority of our current workers’ compensation insurance policies cover claims for a particular event above a $2.0 million deductible limit, on a “per occurrence” basis. This results in our being substantially self-insured. For workers’ compensation claims originating in Washington, North Dakota, Ohio, Wyoming, Canada, and Puerto Rico (our “monopolistic jurisdictions”), we pay workers’ compensation insurance premiums and obtain full coverage under government-administered programs (with the exception of our Labor Ready service line in the state of Ohio where we have a self-insured policy). Accordingly, because we are not the primary obligor, our financial statements do not reflect the liability for workers’ compensation claims in these monopolistic jurisdictions. Our insurance carriers and certain state workers’ compensation programs require us to collateralize a portion of our workers’ compensation obligation, for which they become responsible should we become insolvent. The collateral typically takes the form of cash and cash-backed instruments, highly rated investment grade securities, letters of credit, and/or surety bonds. On a regular basis, these entities assess the amount of collateral they will require from us relative to our workers’ compensation obligation. Such amounts can increase or decrease independent of our assessments and reserves. We generally anticipate that our collateral commitments will continue to grow as we grow our business. We pay our premiums and deposit our collateral in installments. The majority of the restricted cash and investments collateralizing our self-insured workers' compensation policies are held in the Trust. We have agreements with certain financial institutions to issue letters of credit as collateral. Our surety bonds are issued by independent insurance companies on our behalf and bear annual fees based on a percentage of the bond, which is determined by each independent surety carrier. These fees do not exceed 2.0% of the bond amount, subject to a minimum charge. The terms of these bonds are subject to review and renewal every one to four years and most bonds can be canceled by the sureties with as little as 60 days' notice. Our workers’ compensation reserves are discounted to their estimated net present value while our collateral commitments are based on the gross, undiscounted reserve. Excess claims reserve includes the estimated obligation for claims above our deductible limits. These are the responsibility of the insurance carriers against which there are no collateral requirements. This amount is included in restricted cash and represents a timing difference between claim payments made by our insurance carrier and the reimbursement from cash held in the Trust. When claims are paid by our carrier, the amount is removed from the workers' compensation reserve but not removed from collateral until reimbursed to the carrier. Represents deductible and self-insured reserves where collateral is not required. Our workers’ compensation reserve is established using estimates of the future cost of claims and related expenses, which are discounted to their estimated net present value. We discount our workers' compensation liability as we believe the estimated future cash outflows are readily determinable. The discounted workers’ compensation claims reserve was $266.3 million at December 25, 2015. Our workers' compensation reserve for deductible and self-insured claims is established using estimates of the future cost of claims and related expenses that have been reported but not settled, as well as those that have been incurred but not reported. Reserves are estimated for claims incurred in the current year, as well as claims incurred during prior years. Changes in medical and time loss (“indemnity”) costs. Changes in mix between medical only and indemnity claims. Regulatory and legislative developments impacting benefits and settlement requirements. Type and location of work performed. The impact of safety initiatives. Positive or adverse development of claims. Our workers’ compensation claims reserves are discounted to their estimated net present value using discount rates based on returns of “risk-free” U.S. Treasury instruments with maturities comparable to the weighted average lives of our workers’ compensation claims. At December 25, 2015, the weighted average rate for deductible and self-insured claims was 1.8%. The claim payments are made over an estimated weighted average period of approximately 5.0 years. Our workers’ compensation reserves include estimated expenses related to claims above our deductible limits (“excess claims”), and a corresponding receivable for the insurance coverage on excess claims based on the contractual policy agreements we have with insurance carriers. We discount this reserve and corresponding receivable to its estimated net present value using the discount rates based on average returns of “risk-free” U.S. Treasury instruments available during the year in which the liability was incurred. At December 25, 2015, the weighted average rate was 2.4%. The claim payments are made and the corresponding reimbursements from our insurance carriers are received over an estimated weighted average period of approximately 16 years. The discounted workers’ compensation reserve for excess claims and the corresponding receivable for the insurance on excess claims were $49.0 million and $42.6 million as of December 25, 2015 and December 26, 2014, respectively. Our self-insurance reserves are discounted to their estimated net present value using discount rates based on returns of “risk-free” U.S. Treasury instruments with maturities comparable to the weighted average lives of our workers’ compensation claims. At December 25, 2015, the weighted average rate was 1.8%. Payments made against self-insured claims are made over a weighted average period of approximately 5.0 years. Changes in reserve estimates are reflected in the statement of operations in the period when the changes in estimates are made. The discount is amortized over the estimated weighted average life. In addition, any changes to the estimated weighted average lives and corresponding discount rates for actual payments made are reflected in the statement of operations in the period when the changes in estimates are made. Changes to our excess claims are discounted to its estimated net present value using the risk-free rates associated with the actuarially determined weighted average lives of our excess claims. Certain workers’ compensation insurance companies with which we formerly did business are in liquidation and have failed to pay a number of excess claims to date. We have recorded a valuation allowance against all of the insurance receivables from the insurance companies in liquidation. Effective December 1, 2015, we acquired SIMOS, including $8.5 million of workers' compensation liability. For the period ended December 25, 2015, the assumed liability was reduced for payments and changes to actuarial estimates. Effective June 30, 2014, we acquired Seaton, including $26.4 million of workers' compensation liability. For the period ended December 26, 2014, the assumed liability was reduced for payments and changes to actuarial estimates. Effective February 4, 2013, we acquired substantially all of the assets and assumed certain liabilities of MDT, including $9.4 million of workers' compensation liability. For the period ended December 27, 2013, the assumed liability was reduced for payments and changes to actuarial estimates. The following table provides a summary of our contractual obligations as of the end of fiscal 2015. We expect to fund these commitments with existing cash and cash equivalents, and cash flows from operations. Interest and fees are calculated based on the rates in effect at December 25, 2015. Our Revolving Credit Facility expires in 2019. For additional information, see Note 9: Long-term Debt to the Consolidated Financial Statements included in Item 8 of this Annual Report on Form 10-K. Excludes estimated expenses related to claims above our self-insured limits, for which we have a corresponding receivable based on the contractual policy agreements we have with insurance carriers. For additional information, see Note 8: Workers' Compensation Insurance to the Consolidated Financial Statements included in Item 8 of this Annual Report on Form 10-K. Represents scheduled distributions based on the elections of plan participants. Additional payments may be made if plan participants terminate, retire, or schedule distributions during the periods presented. For additional information, see Note 13: Defined Contribution Plans to the Consolidated Financial Statements included in Item 8 of this Annual Report on Form 10-K. Excludes all payments related to branch leases with short-term cancellation provisions, typically within 90 days. For additional information, see Note 10: Commitments and Contingencies to the Consolidated Financial Statements included in Item 8 of this Annual Report on Form 10-K.
Purchase obligations include agreements to purchase goods and services that are enforceable, legally binding, and specify all significant terms. Purchase obligations do not include agreements that are cancelable without significant penalty. An additional cash payment of $22.5 million of contingent consideration may be payable in 2017, depending on the performance of SIMOS through fiscal 2016. For additional information, see Note 2: Acquisitions to the Consolidated Financial Statements included in Item 8 of this Annual Report on Form 10-K. Liability for unrecognized tax benefits has been excluded from the table above, as the timing and/or amounts of any cash payment is uncertain. For additional information, see Note 14: Income Taxes, respectively, to the Consolidated Financial Statements included in Item 8 of this Annual Report on Form 10-K.
Management’s Discussion and Analysis of Financial Condition and Results of Operations discusses our consolidated financial statements, which have been prepared in accordance with accounting principles generally accepted in the United States of America (“U.S. GAAP”). The preparation of these financial statements requires management to make estimates and assumptions that affect the reported amounts of assets and liabilities, and the disclosure of contingent assets and liabilities at the date of the consolidated financial statements, and the reported amounts of revenue and expenses during the reporting period. On an ongoing basis, management evaluates its estimates and judgments. Management bases its estimates and judgments on historical experience and on various other factors that are believed to be reasonable under the circumstances, the results of which form the basis for making judgments about the carrying value of assets and liabilities that are not readily apparent from other sources. Actual results may differ from these estimates under different assumptions or conditions. Management believes that the following accounting estimates are the most critical to aid in fully understanding and evaluating our reported financial results, and they require management’s most difficult, subjective, or complex judgments, resulting from the need to make estimates about the effect of matters that are inherently uncertain. We maintain reserves for workers’ compensation claims, including the excess claims portion above our deductible, using actuarial estimates of the future cost of claims and related expenses. These estimates include claims that have been reported but not settled and claims that have been incurred but not reported. These reserves, which reflect potential liabilities to be paid in future periods based on estimated payment patterns, are discounted to estimated net present value using discount rates based on average returns on “risk-free” U.S. Treasury instruments, which are evaluated on a quarterly basis. We evaluate the reserves regularly throughout the year and make adjustments accordingly. If the actual cost of such claims and related expenses exceeds the amounts estimated, additional reserves may be required. Changes in reserve estimates are reflected in the statement of operations in the period when the changes in estimates are made. Our workers’ compensation reserves include estimated expenses related to claims above our self-insured limits (“excess claims”) and a corresponding receivable for the insurance coverage on excess claims based on the contractual policy agreements we have with insurance companies. We discount the reserve and its corresponding receivable to its respective estimated net present value using the risk-free rates associated with the actuarially determined weighted average lives of our excess claims. When appropriate, based on our best estimate, we record a valuation allowance against the insurance receivable to reflect amounts that may not be realized. There are two main factors that impact workers’ compensation expense: the number of claims and the cost per claim. The number of claims is driven by the volume of hours worked, the business mix which reflects the type of work performed, and the safety of the environment where the work is performed. The cost per claim is driven primarily by the severity of the injury, the state in which the injury occurs, related medical costs, and lost-time wage costs. A 5% change in the cost of claims incurred would result in a change to workers' compensation expense of approximately $5 million. Our reserve balances have been positively impacted primarily by the success of our accident prevention programs. In the event that we are not able to further reduce our accident rates, the positive impacts to our reserve balance will diminish. We establish an allowance for doubtful accounts for estimated losses resulting from the failure of our customers to make required payments. The allowance for doubtful accounts is determined based on historical write-off experience, expectations of future write-offs, and current economic data, and represents our best estimate of the amount of probable credit losses. The allowance for doubtful accounts is reviewed quarterly and past due balances are written-off when it is probable the receivable will not be collected. If the financial condition of our customers were to deteriorate, resulting in an impairment of their ability to make payments, additional allowances may be required. We account for our business acquisitions using the purchase method of accounting. The purchase price of an acquisition is allocated to the underlying assets acquired and liabilities assumed based upon their estimated fair values at the date of acquisition. We determine the estimated fair values after review and consideration of relevant information including discounted cash flows, quoted market prices, and estimates made by management. Determining the fair value of an acquired company is judgmental in nature and involves the use of significant estimates and assumptions. This analysis requires significant judgments, including estimation of future cash flows, which is dependent on forecasts, estimation of the long-term rate of growth, estimation of the useful life over which cash flows will occur, and determination of a weighted average cost of capital, which is risk-adjusted to reflect the specific risk profile of the business being purchased. Intangible assets that arise from contractual/legal rights, or are capable of being separated, are measured and recorded at fair value and amortized over the estimated useful life. If practicable, assets acquired and liabilities assumed arising from contingencies are measured and recorded at fair value. If not practicable, such assets and liabilities are measured and recorded when it is probable that a gain or loss has occurred and the amount can be reasonably estimated. The residual balance of the purchase price, after fair value allocations to all identified assets and liabilities, represents goodwill. Goodwill acquired in business combinations is assigned to the reporting unit(s) expected to benefit from the combination as of the acquisition date. Acquisition-related costs are expensed as incurred. Our acquisitions may include contingent consideration, which require us to recognize the fair value of the estimated liability at the time of the acquisition. Subsequent changes in the estimate of the amount to be paid under the contingent consideration arrangement are recognized in the Consolidated Statements of Operations. Cash payments for contingent or deferred consideration are classified within cash flows from investing activities within the Consolidated Statements of Cash Flows. broadens our Staff Management on-premise contingent staffing solution. SIMOS was acquired for a cash purchase price of $67.5 million. An additional cash payment between zero and $22.5 million of contingent consideration will be payable in mid fiscal 2017, depending on SIMOS achieving a fiscal 2016 earnings before interest, taxes, depreciation, and amortization target ("EBITDA target"). The actual EBITDA achieved must be in excess of 87.5% of the EBITDA target (“EBITDA threshold”) before any amounts are earned. The preliminary undiscounted fair value of the contingent consideration as of the acquisition date was determined to be $22.2 million. Using a risk adjusted weighted average cost of capital rate of 10.0%, the present value of the contingent consideration was estimated to be $19.3 million, as of the acquisition date. The contingent consideration liability was based on a probability weighted fair value measurement using unobservable inputs (Level 3) which rely on management's estimates of assumptions that market participants would use in pricing the liability. The valuation is judgmental in nature and involves the use of significant estimates and assumptions to forecast fiscal 2016 results. We expect to complete the purchase accounting for SIMOS during the first quarter of fiscal 2016. We will review and re-assess the estimated fair value of the contingent consideration on a quarterly basis thereafter. The updated fair value could differ materially from the initial estimates. Changes in the estimated fair value of our contingent consideration liability related to the time component of the present value calculation will be reported in interest expense. Adjustments to the estimated fair value related to changes in all other unobservable inputs, if due to changes in facts and circumstances after the purchase date, will be reported in operating income. Customer demand for contingent staffing services is subject to volatility based on overall economic conditions and workforce flexibility needs. As a consequence, revenues tend to decrease quickly when the economy begins to weaken and/or individual customer demand for workforce flexibility weakens. If actual results were to significantly deviate from management's estimates and assumptions of future performance, we could experience a material change in the estimated fair value. We evaluate goodwill and indefinite-lived intangible assets for impairment on an annual basis as of the first day of our second fiscal quarter, or more frequently if an event occurs or circumstances change that would indicate that impairment may exist. These events or circumstances could include a significant change in the business climate, legal factors, operating performance indicators, competition, or sale or disposition of a significant portion of a reporting unit. We monitor the existence of potential impairment indicators throughout the fiscal year. Goodwill is the excess of the purchase price over the fair value of identifiable net assets acquired in business combinations. If necessary, we reassign goodwill using a relative fair value allocation approach. We test for goodwill impairment at the reporting unit level. We consider our service lines to be our reporting units for goodwill impairment testing. We evaluate our reporting units on an annual basis. There were no substantial changes to our previously reported reporting units. The impairment test involves comparing the fair value of each reporting unit to its carrying value, including goodwill. Fair value reflects the price a market participant would be willing to pay in a potential sale of the reporting unit. If the fair value exceeds carrying value, then we conclude that no goodwill impairment has occurred. If the carrying value of the reporting unit exceeds its fair value, a second step is required to measure possible goodwill impairment loss. The second step includes hypothetically valuing the tangible and intangible assets and liabilities of the reporting unit as if the reporting unit had been acquired in a business combination. Then, the implied fair value of the reporting unit’s goodwill is compared to the carrying value of that goodwill. If the carrying value of the reporting unit’s goodwill exceeds the implied fair value of the goodwill, we recognize an impairment loss in an amount equal to the excess, not to exceed the carrying value. Determining the fair value of a reporting unit involves the use of significant estimates and assumptions to evaluate the impact of operational and macroeconomic changes on each reporting unit. The fair value of each reporting unit is estimated using an income approach and applies a fair value methodology based on discounted cash flows. This analysis requires significant estimates and judgments, including estimation of future cash flows, which is dependent on internal forecasts, estimation of the long-term rate of growth for our business, estimation of the useful life over which cash flows will occur, and determination of our weighted average cost of capital, which is risk-adjusted to reflect the specific risk profile of the reporting unit being tested. Our weighted average cost of capital for our most recent impairment test ranged from 12.0% to 13.5%. We also apply the market approach, which identifies similar publicly traded companies and develops a correlation, referred to as a multiple, to apply to the operating results of the reporting units. The primary market multiples we compare to are revenue and earnings before interest, taxes, depreciation, and amortization. These combined fair values are then reconciled to the aggregate market value of our shares of common stock outstanding on the date of valuation, resulting in a reasonable control premium. We base fair value estimates on assumptions we believe to be reasonable but that are unpredictable and inherently uncertain. Actual future results may differ from those estimates. We consider a reporting unit’s fair value to be substantially in excess of its carrying value at 20% or greater. Based on our test, all of our legacy TrueBlue reporting units' fair values were substantially in excess of their carrying values. Accordingly, no impairment loss was recognized. The estimated fair value of our PlaneTechs reporting unit was in excess of 20% of its carrying value. However, this reporting unit continues to focus on transitioning to a more diversified aviation customer portfolio, and expanding its provision of mechanics and technicians to other transportation industries. As such, we believe this reporting unit carries more risk of future impairment in comparison to our other legacy TrueBlue reporting units. In the event the forecasted revenue growth rate declines by approximately 4% or gross margin as a percentage of revenue declines by approximately 1% or the discount rate increases by approximately 3%, the carrying value of our PlaneTechs reporting unit would exceed its fair value. In that event, we would be required to measure for possible goodwill impairment. We will continue to closely monitor the operational performance of the PlaneTechs reporting unit as it relates to goodwill impairment. Effective June 30, 2014, our acquisition of Seaton added a full service line of on-premise staffing with Staff Management | SMX ("Staff Management"), complementary service offerings in recruitment process outsourcing ("RPO") with the PeopleScout and hrX service lines, and the management of contingent labor services provider ("MSP") solutions portion of Staff Management. We consider the acquired service lines to be reporting units for goodwill impairment testing. In our annual impairment test, all of our acquired Seaton reporting units' estimated fair values exceeded their carrying values. However, the acquired PeopleScout, hrX, and MSP reporting units' fair values were not substantially in excess of their carrying values. The estimated fair value of the PeopleScout reporting unit was in excess of its carrying value by approximately 11% as of the assessment date, which is primarily due to the proximity of the goodwill impairment assessment date to the recent acquisition date of Seaton. Goodwill of $48.0 million was allocated to the PeopleScout reporting unit. A discount rate of 12.0% was used in calculating the fair value of this reporting unit. In the event that the discount rate increases by 1% or the forecasted revenue growth rate declines by approximately 1% or gross margin as a percentage of revenue declines by approximately 1%, the carrying value of the reporting unit would exceed its fair value. Should any one of these events occur, we would be required to measure for possible goodwill impairment. We will continue to monitor the operational performance of this newly acquired reporting unit as it relates to goodwill impairment. The estimated fair value of the MSP reporting unit was in excess of its carrying value by approximately 15% as of the assessment date, which is primarily due to the proximity of the goodwill impairment assessment date to the recent acquisition date of Seaton. Goodwill of $12.0 million was allocated to the MSP reporting unit. A discount rate of 12% was used in calculating the fair value of this reporting unit. In the event that the discount rate increases by 1% or the forecasted revenue growth rate declines by approximately 1% or gross margin as a percentage of revenue declines by approximately 1%, the carrying value of the reporting unit would exceed its fair value. Should any one of these events occur, we would be required to measure for possible goodwill impairment. We will continue to monitor the operational performance of this newly acquired reporting unit as it relates to goodwill impairment. The estimated fair value of the hrX reporting unit was in excess of its carrying value by approximately 7% as of the assessment date, which is due to the proximity of the goodwill impairment assessment date to the recent acquisition date of Seaton and actual post-acquisition results' not meeting revenue or profitability targets forecasted at the time of acquisition. Historically, hrX focused exclusively on the Australia and New Zealand marketplace selling both recruitment process outsourcing services and Springboard, their applicant tracking system ("ATS"). The future success of hrX will become progressively more dependent on expanding their geographic reach for their RPO services and ATS solutions as part of the strategy for PeopleScout hrX to globalize their service offerings. We have updated our forecasts for this reporting unit and will closely monitor its performance against these revised forecasts. Less than forecasted performance will result in reevaluation of our impairment conclusion at an interim date. Goodwill of $56.9 million was allocated to the hrX reporting unit. A discount rate of 12% was used in calculating the fair value of this reporting unit. In the event that the discount rate increases by 0.9% or the forecasted revenue growth rate declines by approximately 2% or gross margin as a percentage of revenue declines by approximately 3%, the carrying value of the reporting unit would exceed its fair value. Should any one of these events occur, we would be required to measure for possible goodwill impairment. Our services are subject to volatility based on overall economic conditions. As a consequence, our revenues tend to increase quickly when the economy begins to grow. Conversely, our revenues also decrease quickly when the economy begins to weaken, as occurred during the most recent recession. If actual results were to significantly deviate from management's estimates and assumptions of future performance, we could experience a material impairment to our goodwill. recognize an impairment loss in an amount equal to the excess. Considerable management judgment is necessary to determine key assumptions, including projected revenue, royalty rates and appropriate discount rates. We performed our annual indefinite-lived intangible asset impairment test as the first day of our second fiscal quarter and determined that the estimated fair values exceeded the carrying amounts of all our indefinite-lived trade names. Accordingly, no impairment loss was recognized. From time to time we are subject to compliance audits by federal, state, and local authorities relating to a variety of regulations including wage and hour laws, taxes, workers’ compensation, immigration, and safety. We are also subject to legal proceedings in the ordinary course of our operations. We have established reserves for contingent legal and regulatory liabilities. We record a liability when our management judges that it is probable that a legal claim will result in an adverse outcome and the amount of liability can be reasonably estimated. To the extent that an insurance company is contractually obligated to reimburse us for a liability, we record a receivable for the amount of the probable reimbursement. We evaluate our estimated liability regularly throughout the year and make adjustments as needed. If the actual outcome of these matters is different than expected, an adjustment is charged or credited to expense in the period the outcome occurs or the period in which the estimate changes. We account for income taxes by recording taxes payable or refundable for the current year and deferred tax assets and liabilities for the future tax consequences of events that have been recognized in our financial statements or tax returns. We measure these expected future tax consequences based upon the provisions of tax law as currently enacted; the effects of future changes in tax laws are not anticipated. Future tax law changes, such as changes to federal and state corporate tax rates and the mix of states and their taxable income, could have a material impact on our financial condition or results of operations. When appropriate, we record a valuation allowance against deferred tax assets to offset future tax benefits that may not be realized. In determining whether a valuation allowance is appropriate, we consider whether it is more likely than not that all or some portion of our deferred tax assets will not be realized, based in part upon management’s judgments regarding future events and past operating results. See Note 1: Summary of Significant Accounting Policies, to our Consolidated Financial Statements included in Item 8 of this Annual Report on Form 10-K.
We are exposed to market risk related to changes in interest rates and foreign currency exchange rates, each of which could adversely affect the value of our investments. We do not currently use derivative financial instruments. Our exposure to market risk for changes in interest rates relates primarily to our investment portfolio and our long-term debt. Restricted cash and investments consist principally of collateral that has been provided or pledged to insurance carriers for workers' compensation and state workers' compensation programs. Our insurance carriers and certain state workers' compensation programs require us to collateralize a portion of the workers' compensation obligation. The collateral typically takes the form of cash and cash equivalents and highly rated investment grade securities, primarily in municipal debt securities, corporate debt securities, and agency mortgage-backed securities. The majority of our collateral obligations are held in a trust ("Trust") at the Bank of New York Mellon. The individual investments within the Trust are subject to credit risk due to possible rating changes, default, or impairment. We monitor the portfolio to ensure this risk does not exceed prudent levels. We consistently apply and adhere to our investment policy of holding high quality, diversified securities. We have the positive intent and ability to hold these investments until maturity and accordingly have classified them as held-to-maturity. For additional information, see Note 5: Restricted Cash and Investments, to the Consolidated Financial Statements included in Item 8 of this Annual Report on Form 10-K.
We are subject to the risk of fluctuating interest rates on our Revolving Credit Facility and Term Loan, which bear interest at variable rates. For additional information, see Note 9: Long-term Debt, to the Consolidated Financial Statements included in Item 8 of this Annual Report on Form 10-K.
Based on the principal balance of our outstanding Term Loan of $27.6 million and Revolving Credit Facility of $218.1 million as of December 25, 2015, an increase or decrease of 10% in the interest rate over the next year would not have a material effect on our annual interest expense. The majority of our revenue, expense, liabilities, and capital purchasing activities are transacted in U.S. dollars. However, because a portion of our operations consists of activities outside of the U.S., we have transactions in other currencies, primarily the Canadian and Australian dollar. We have not hedged our foreign currency translation risk. We have the ability to hold our foreign currency denominated assets indefinitely and do not expect that a sudden or significant change in foreign exchange rates will have a material impact on future operating results or cash flows. To the Board of Directors and Shareholders of TrueBlue, Inc.
We have audited the accompanying consolidated balance sheets of TrueBlue, Inc. and subsidiaries (the “Company”) as of December 25, 2015 and December 26, 2014, and the related consolidated statements of operations and comprehensive income, shareholders’ equity, and cash flows for each of the three years in the period ended December 25, 2015. Our audits also included the financial statement schedule listed in the Index at Item 15(a)(2). These financial statements and financial statement schedule are the responsibility of the Company’s management. Our responsibility is to express an opinion on these financial statements and financial statement schedule based on our audits. In our opinion, such consolidated financial statements present fairly, in all material respects, the financial position of TrueBlue, Inc. and subsidiaries as of December 25, 2015 and December 26, 2014, and the results of their operations and their cash flows for each of the three years in the period ended December 25, 2015, in conformity with accounting principles generally accepted in the United States of America. Also, in our opinion, such financial statement schedule, when considered in relation to the basic consolidated financial statements taken as a whole, presents fairly, in all material respects, the information set forth therein. We have also audited, in accordance with the standards of the Public Company Accounting Oversight Board (United States), the Company’s internal control over financial reporting as of December 25, 2015, based on the criteria established in Internal Control - Integrated Framework (2013) issued by the Committee of Sponsoring Organizations of the Treadway Commission and our report dated February 22, 2016 expressed an unqualified opinion on the Company’s internal control over financial reporting.